The Kumbhalgarh Sanctuary is spread over an area of 578 square kilometers. It is the only sanctuary in Rajasthan where one can observe the activities of the rarely found wolf. Above forty wolves inhabit this sanctuary. Though the best time to visit the sanctuary is during the winter months, the wolves can easily be spotted around the water holes in summers because of the scarcity of water. The sanctuary houses a diverse variety of animals. Several endangered and rare species reside in the park. 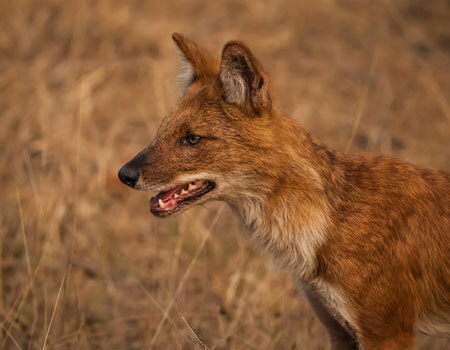 The wildlife that the park houses includes wolf, sloth bear, nilgai, jungle cat, hyena, leopards, chinkara, jackal, sambhar, four-horned antelope and hare. The bird life at Kumbhalgarh sanctuary is vivid. Birds like the grey jungle fowl, peacocks, dove, red spur owls, golden oriole, parakeets, bulbul, grey pigeons and white breasted kingfisher can be seen in this park. The natural beauty of the Kumbhalgarh sanctuary is quite inviting. Apart from trekking on foot, the visitors can enjoy visit to the sanctuary on horse back. It is reachable from Udaipur, a mere 65 kilometres from the sanctuary. The Kumbhalgarh Fort located in Rajasmand district of Udaipur is a major tourist attraction. The remarkable interior of this fort is marked by several palatial buildings and temples. It attracts hordes of tourists from far and wide.